As previously posted here, I spent a wonderful evening making a beautiful acrylic on canvas painting with my niece. I then adapted it for classroom use, using tempera on paper. I believe they turned out just as beautiful! First, mix several shades and tints of warm colored tempera. I love using frosting cups because they can be lidded and stacked for storage. On a 9" X 12" piece of heavy white paper or card stock, have the children begin adding stripes and swirls in a horizontal fashion. I told them it was like the wind blowing back and forth. In this photo, you can see how we handled the sharing of the paint. I would set a cup with brushes in it on the table and give them a minute or two to paint. Then, I would move the cups, rotating the colors around the room. This way, the brushes don't have to be washed after every use and you don't have to mix up more than one cup of each color. Also, the paint moves rather than the student, so there are no accidents with wet brushes or papers. If they had filled their paper before all of the colors had rotated to them, they added some small dots or swirls on top of their stripes. Some beauties on the drying rack. During the next class, we practiced painting trees on white paper before going on to their swirly backgrounds. This gave them confidence in their painting skills. Here, you can see the practice paintings on the table. 1. Paint a trunk going off the bottom of the paper. It should look like a rough rectangle. 2. Split the top of the tree so that it looks like a letter Y. Make sure that the two branches meet in the middle and are as thick as the trunk on each side. 3. Split the tops of each of these branches in half by making a V at the top. 4. At this point, we switched to thinner brushes to finish our trees. Each of those branches are now split in half. Remind students that branches get longer and skinnier the higher up on the tree they are. 5. To finish the tree, add a swirl to each of the ends of the branches. Also, have students look at the tree and add swirly branches to any bare spots on the tree. During the third class, we added sparkly gems to the skies. You could use sequins as a less expensive option. Another option is to have the students make roots and add a horizon line. These were painted before I decided to try the other way. I am not sure which I like better. And THIS is a MR. WRONG. This is what happens when you have a substitute and aren't specific enough. I said to have them glue jewels in the sky, but I should have also said to make sure they kept them off the tree. Ha! I even had one student add a smiley face with gems. *sigh* Oh, well. At least they are being creative and expressing themselves, right? Really lovely. We've been talking about color families and these beautiful warm colors seem so right. Thanks for the post. I can't wait to try this with my students! Thanks for the great tutorial. The background paintings on these are wonderfully expressive. Thanks for the tutorial! Thank you for posting in such an approachable manner. I'm using these lessons with my 7&10 year old kids. 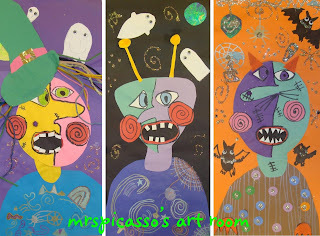 Nice to find fall art that isn't cutesy or crafty but teaches an art skill along the way.